Schwinn offers a line of bikes for all abilities, ages, and experiences to making the thrill of riding a bike something everyone can enjoy. Their bikes are built with the Schwinn Quality standard that comes with over 100 years of cycling expertise and heritage that brings you the best bikes available today. 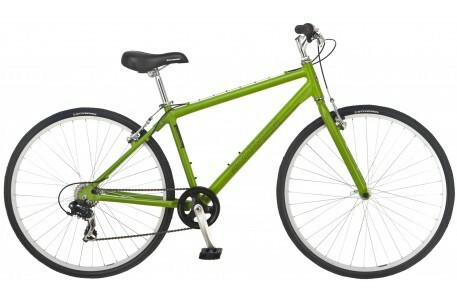 One of their quality and affordable bikes is the Schwinn Median Bike. It features a lightweight aluminum frame that provides a responsive and agile ride. With a 7-speed drivetrain you’ll experience optimal gearing for getting around the city. The front tire has a quick release mounting system that makes the bike easier to store and transport. Plus, you’ll enjoy a comfortable ride with the Schwinn Quality saddle. It comes in a fun sporty green color. My husband had been looking for a bike to help him get in shape and as a way to get in exercise while having fun. He’s really enjoyed the Schwinn Median bike and has already used it quite a bit. We’ve been going on family walks where all our boys will climb on their trikes and bikes and I’ll follow along pushing our newborn in the stroller as my husband rides along side us on his bike. We always have a great time on our family bike rides and enjoy the time outside together and teaching our children the importance of being active. My husband also has taken the bike out for a ride several mornings by himself as well. He’ll go for a half an hour or so ride around the neighborhood. It’s a nice way for him to be able to get out of the house as he works from home. He’s also used the bike to commute to church on one occasion since we are a one car family and he needed to be there earlier than the rest of us. I have even hopped on the bike a few times and like how smooth and easy this bike rides. It is really easy to hop on the bike and get moving for a nice ride. You can find the Schwinn Median bike available exclusively at Target! It retails for just $200 and would make a great Christmas gift this year to gift a teenager or adult that is looking to get more active this coming year or looking for a nice bike for a city commute. Disclosure: I received a Schwinn Median Bike in exchange for my honest review. I was not compensated in any other manner. The opinions expressed above are my own and any claims should be verified on the sponsor’s site. I’m hoping there is a Schwinnn under the tree for me this year! !